Shares of United Spirits Ltd jumped more than 4 per cent in early morning trade on Monday, after liquor giant Diageo increased its stake in the Vijay Mallya-led company. The UK-based world's biggest spirits maker increased its stake in the Indian company through its Dutch arm Relay BV. Relay BV purchased nearly 35 lakh shares in United Spirits through a bulk deal at an average price of Rs 2,474.45 apiece. Following the transaction, valued at Rs 866 crore, Relay's stake in United Spirits jumped from 26.37 per cent to 28.8 per cent. Diageo Plc, a UK based beverages major, has said that it will launch an open offer to acquire an additional 26 per cent stake in Indian firm United Spirits from 10 April, 2013. The company has said that the open offer will close on 26 April, 2013. United Spirits wrote in a filing with the Bombay Stock Exchange (BSE) that JM Financial Institutional Securities Pvt Ltd, which is the manager of the offer, has informed that stock exchange that the offer price will remain at Rs 1,440 per equity share. Proceeds from the United Spirits-Diageo deal will be used to slash Kingfisher Airlines' (KFA's) huge debt, the UB group has confirmed. Vijay Mallya-led Kingfisher is burdened with a bet mountain of Rs 7,500 crore, and its losses widened to Rs 755.17 crore in the December quarter, from Rs 444.26 crore in the corresponding period of the previous year. Liquor tycoon Vijay Mallya's $2.1 billion deal to sell a stake in United Spirits to Diageo Plc has changed the mood of lenders from absolute gloom to some hope, throwing a lifeline to grounded Kingfisher Airlines. Though proceeds from the stake sale will not be sufficient to rescue the grounded carrier, yet it is expected to allow Mallya to make a piecemeal payment to Kingfisher lenders and get them back at the negotiating table for new loans. Diageo Plc has agreed to acquire a majority stake in United Spirits Ltd for $2.1 billion (Rs 11,166.5 crore) but many experts worry that proceeds from the stake sale will not be enough to allow Vijay Mallya to resolve the cash crisis of his struggling carrier Kingfisher Airlines Ltd.
British spirits group Diageo Plc has agreed to acquire a majority stake Vijay Mallya-promoted United Spirits Ltd for $2.1 billion (Rs 11,166.5 crore). Initially, Diageo will acquire a 27.4 per cent stake in United Spirits, plus subscribe to new shares to be issued by the company at Rs 1,440 apiece. Subsequently, the British firm will acquire an additional 26 per cent stake by buying share from public shareholders at the same price. Finally, it will acquire a 53.4 per cent stake in Indian liquor giant United Spirits. Vijay Mallya-owned United Spirits Ltd (USL) has finally agreed to settle a dispute relating to "Officer's Choice" whisky brand with Allied Blenders & Distillers (ABD) out of court. As terms of settlement, USL will withdraw all cases against ABD filed with Delhi and Calcutta High Courts, while ABD will reportedly pay one-time settlement amount of Rs 8 crore to USL. 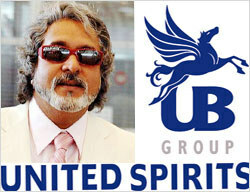 Struggling entrepreneur Vijay Mallya's UB Group has confirmed that the company is once again in talks with UK-based spirit group Diageo over stake sale.Mallya's United Spirits Ltd. revealed the ongoing talks over the possible transactions in its recent filing to the Bombay Stock Exchange (BSE). The shares of United Spirits Ltd, led by billionaire Vijay Mallya, rose more than 10 per cent on the domestic stock exchange following reports that Diageo Ltd is looking to acquire a stake in the company. The rally ahead of the company's annual general meeting (AGM) on Tuesday indicates that the investors are expecting fresh investments in the company by Diageo. The deal is expected to be announced in the coming month, according to several media reports. Sudarshan Sukhani of s2analytics. com stated that the stock of 'United Spirits Limited' (USL) may decline to Rs 450. United Spirits Ltd has announced that its hareholders have approved a plan to raise about $225 million through foreign-currency convertible bonds (FCCBs). The FCCB, which are convertible to equity shares, will include a greenshoe option of up to $50 million, United said in a filing with the stock exchange. Technical Analyst Rajesh Satpute has maintained 'buy' rating on United Spirits Limited stock with a target of Rs 1140. Mr. Satpute said that the stock can be purchased with a stop loss of Rs 1025. The stock of the company, on April 13, closed at Rs 1065.90 on the Bombay Stock Exchange (BSE). Stock market analysts are of the view that investors can buy United Spirits Ltd stock to achieve an intraday target of Rs 1119. According to them, investors can purchase the stock between Rs 1090-1100 with a strict stop loss of Rs 1072. Shares of the company, on Thursday (Nov 05), closed at Rs 1,090.40 on the Bombay Stock Exchange (BSE). Current EPS & P/E ratio stood at 26.55 and 40.47 respectively. The share price has seen a 52-week high of Rs 1740 and a low of Rs 428.40 on BSE. United Spirits Ltd (USL), India's biggest alcoholic drinks company, has registered a net profit of Rs 69.60 crore for the second quarter ended September 30, down 25% against Rs 93.89 crore during the year-ago period. However, company’s total income grew up by 19 per cent to Rs 1091 crore for the quarter ended September 30, 2009, compared with Rs 914 crore for the quarter ended September 30, 2008. Vijay Mallya-led United Spirits has informed that the company has raised Rs 1615.60 crore by private placement of shares with qualified institutional buyers. The company has sold 1.76 crore equity shares through qualified institutional placement (QIP) to investors at Rs 913.70 per share, representing 16.4 per cent stake. The company commenced its QIP on October 14 and closed the issue on October 20. Shaw Wallace & Company is planning to sell its entire 10.27 per cent stake in the Vijay Mallya-led United Spirits Ltd (USL), in a bid to reduce some part of its debt burden.